Found on the Grand Strand’s southern end in Murrells Inlet, South Carolina, Brookgreen Gardens — one of the Myrtle Beach area’s leading tourist attractions — offers its guests over 9,00 acres of natural and manmade beauty. Featuring a unique combination of art, nature and history, the sculpture garden/nature preserve is listed on the U.S. National Register of Historic Places, houses nearly 1,500 works of American figurative sculpture (making it the nation’s most extensive collection) and also offers a Lowcountry Zoo that spotlights an impressive range of the region’s wildlife. And while the destination is popular with visitors year-round, it shines especially bright during the holiday season, when the annual Nights of a Thousand Candles tradition sees more than 4,500 hand-lit candles and 100,000-plus twinkling lights illuminate the sculpture gardens’ grounds. Boosting the attraction’s holiday cheer even more, carolers, handbell choirs and other musicians perform traditional Christmas favorites during the event, and visitors can grab some hot cider to warm them up as they enjoy the spectacle. Space is limited, and tickets (priced for non-members at $25 for adults and $15 for children or for members at $20 for adults and $12 for children) must be purchased before arrival. 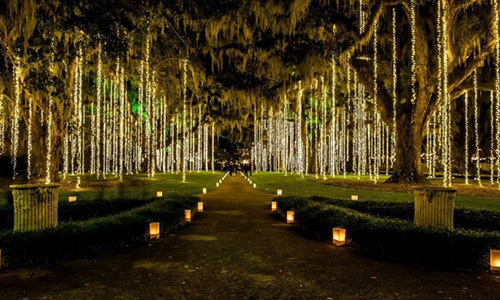 For more information on Nights of a Thousand Candles, visit brookgreen.org or call 843-235-6000. When you’re ready to plan your holiday getaway on the Grand Strand, book a stay at Bay View Resort on the Myrtle Beach oceanfront. With our central locaiton and comfortable oceanfront accommodations, we’ve got everything you’ll need to make some bright holiday memories on the Carolina coast.